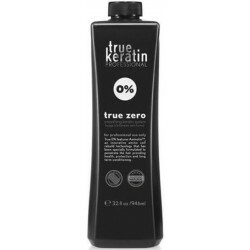 True Keratin True Zero Smoothing Keratin Treatment 0% Formaldehyde 946ml/32oz - Just Beauty Products, Inc. True Keratin True Zero Smoothing Keratin Treatment 0% Formaldehyde 946ml/32oz. Effectively deposits and seals essential amino acids and vitamins to the hair, smoothing away frizz while adding luminous shine for up to three months. 0% Formaldehyde released before, during, or after the Treatment. True Keratin True Zero Smoothing Keratin Treatment 0% Formaldehyde 946ml/32oz. Promotes long lasting frizz-free protection. Adds luminous shine, health, and elasticity to your hair. Features Aminotin™, an innovative amino cell rebuilding technology that provides health, protection, and long term-conditioning for all hair types. Effectively deposits and seals essential amino acids and vitamins to the hair, smoothing away frizz while adding luminous shine for up to three months. 0% Formaldehyde released before, during, or after the Treatment. KEY INGREDIENTS Certified Organic Raspberry Fruit Extract: Rich in Vitamins A & C, calcium, and magnesium. Nourishes individual strands for thicker, stronger hair. Wash hair with Truekeratin Grapefruit Clarifying Shampoo in order to open the hair cuticle. Towel dry. Apply SuperSleek+ Pre-treatment spray lightly throughout the hair. Wait 10 minutes, and apply True Zero evenly avoiding saturation. Wait 30 minutes to deeply condition, lightly rinse with water, apply SuperSleek+ Mask and rinse thoroughly. Blow-dry and seal in the treatment with Prosmooth 450° (230°C) flat iron. Warning: For external use only. Avoid contact with eyes and do not ingest. If product gets into your eyes, flush inmediately with plenty of water and seed medical assistance. Keep out of the reach of children. Women who are pregnant or breast-feeding should avoid contact with the product. Ingredients: Water (Aqua),Cetyl Alcohol, Hydrozyethyl Cellulose, Glycerin, Mineral Oil, Hydrolyzed Keratin, Stearmidopropyl Dimethylamine, Silk Amino Acids, Hydrolyzed Collagen, Hydrolyzed Wheat Protein, Argania Spinosa Kernel Oil, Polyquaternium-11, Phenyl Dimethicone, Cyclopentasiloxane, Dimethiconol, Cyclomethicone, Fragance (Parfum), Acetic Acid, Glutamine, Sodium PCA (and) Betaine (and) Sorbitol (and) Glycine (and) Alanine (and) Alanine (and) Proline (and) Serine (and) Alanine (and) Arginine (and) Lysine (and) Glutamic Acid, Certified Organic Camellia Sinensis Leaf Extract, Certified Organic Pumica Granatum Extract, Certified Organic Calendula Officinalis, Phenoxyethanol (and) Ethylhexylglycerin, EDTA.